12.01.05 – While Hurricane Katrina wreaked death and destruction across the Gulf Coast , it inadvertently accomplished something constructive: it provided crucial data for emergency response research taking place at Calit2. 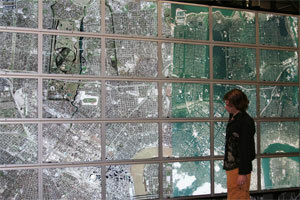 Researchers Falko Kuester and Stephen Jenks, assistant professors of electrical engineering and computer science, used the catastrophe to expand the capabilities of their Highly Interactive Parallelized Display Wall, the world’s highest-resolution grid-based display for visualizing and manipulating massive data sets. HIPerWall, a 50-panel, 23 x 9-ft. wall that provides a resolution of 200 million pixels brings to life terabyte-sized data sets, including biomedical images, climate datasets and geological data. images of New Orleans simultaneously. After Katrina hit, Jenks and Kuester used HIPerWall to display satellite and aerial images of pre-and post-hurricane New Orleans , advancing research that one day will allow emergency first-responders to react to crises more quickly. Using TerraServer, a U.S. Geological Survey Web portal, Jenks downloaded nearly 100 pre- and post-Katrina satellite and aerial images of New Orleans. After the download, Jenks geo-referenced the images – aligning landmarks in “before” photos to the same landmarks in the “after” photos – then stitched them together into a panorama. The work was time-consuming and computation intensive, exposing the need for more sophisticated image manipulation techniques. Jenks used a self-authored computer program to tile the individual images into one continuous view. When displayed on HIPerWall – one above the other – the before and after images correlate almost perfectly and reveal incredible detail. HIPerWall’s resolution is nearly twice that of the world’s next-highest resolution display wall; it has 100 times the resolution of state-of-the-art high-definition television. In the post-Katrina images, viewers can clearly see debris fields, the depth of the storm surge and houses that once lined residential streets lying twisted in the middle of the road. Kuester says the research team still has a long way to go. The goal is to develop different ways to process available information, ultimately speeding the process.